An embryonic shoot containing the growing stem tip surrounded by young leaves or flowers or both, and the whole frequently enclosed by special protective leaves, the bud scales. Buds that give rise to flowers only are termed flower buds, or in some cases, fruit buds. If a bud grows into a leafy shoot, it is called a leaf bud, or more accurately, a branch bud. A bud which contains both young leaves and flowers is called a mixed bud. An Egyptian style column capital in the form of a stylized lotus bud; also, a small, foliated portion of a Corinthian capital located between the base of two acanthus leaves above the caulicoles. in plants, the rudiment of a shoot. A foliage bud consists of rudiments of leaves of various ages and a short rudimentary axis (stem) with an apical cone. The leaves are densely arranged on the axis, covering the axis and each other. A mixed bud has both leaves and the primordia of inflorescences and flowers. Some floral buds include the primordia of only one flower. Leaves arise regularly on the apical cone of the stem from bottom to top. At first they grow unevenly, mainly on their underside; they finally arch over the shoot apex, leading to the formation of a closed bud. Such a structure has adaptive significance. The outer leaf organs protect the inner meristem from desiccation and injury. They also create within the bud a dark, moist chamber favorable to the formation of the leaf primordia and to the further growth of the stem. When the bud unfolds as a result of uneven growth, mainly on the upperside of the stem, the leaves bend away from the stem and separate owing to the growth of the stem internodes, which are almost nonexistent in the bud. Apical, or terminal, buds allow the shoot to grow in length; lateral buds ensure branching and formation of the shoot system. In most seed plants, the lateral buds are borne in the axil and are called axillary buds. They arise as external meristematic tubercles in the axils of the leaf primordia during the early developmental stages of the parent shoot, which is often still inside the maternal bud. Nutrients and protection are provided to the bud by the bract in whose axil the parent bud is borne. 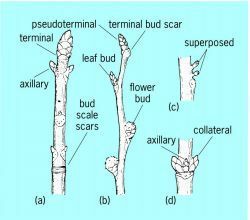 Usually only one bud is formed in the axil, although in some plants there are accessory, or supernumerary, buds that rest one on top of the other (superposed buds, as in honeysuckle) or side by side in a row (collateral buds, as in garlic). Adventitious buds develop endogenously, for example, in the interior tissue layers of the adult stem, root, and, sometimes, leaf. The buds of higher spore-bearing plants (mosses and ferns) are most often adventitious. The outer leaves of a bud or their parts (stipules, base, petiole) are sometimes converted to bud scales that often have a special anatomical structure. They may have highly developed integumentary tissues or may be covered with numerous hairs. Some become corky or woody, and others secrete resin. Such buds, known as closed buds, are characteristic of most trees, shrubs, and perennial herbs of the frigid and temperate zones. They are also common in tropical and subtropical regions that have a dry season. When the bud opens, the scales usually fall. The internodes between them remain short, and closely placed groups of ringlike scars form on the stem. In trees and shrubs of the temperate zone, the annual growth and the age of branches can be determined by counting the rings. Open, or naked, buds predominate in trees of tropical rain forests. Such buds, which are scaleless, are also prevalent in the temperate zone on nonwintering and, sometimes, wintering herbaceous shoots (houseleek and Eloded). Open buds may be observed in temperate latitudes on the tips of young shoots of woody plants during the period of “open growth.” Wintering open buds are rarely encountered in such plants (alder buckthorn). The arrangement of young leaves in the bud in relation to one another is called estivation. The arrangement may be valvate, imbricate, coiled, semicoiled, or amplectant. The type of foliation is determined by how or whether the blade of each leaf forms. It may be plicate, many times plicate, convolute, revolute, or involute. Estivation and foliation are hereditary features that are taken into account in plant taxonomy. As a rule, the newly formed bud does not open in the shoot immediately but only after a definite number of leaf primordia have developed. In the winter or during droughts, mature buds often undergo a somewhat prolonged period of rest. Such buds, which yield shoots in the spring or at the onset of the rainy season, are called renewal buds. The entire shoot of the following year, including the inflorescence (lilac, elder, lily of the valley, asarum) or only a part of it (linden, goldenrod), may be formed in the autumn in wintering renewal buds; in many trees and shrubs wintering buds include both foliage and floral buds (birch, apple, poplar). The appearance of buds in the axils of all leaves is essential for the branching and renewal of plants. To ensure the continued growth of a tree or shrub, a substantial proportion of the buds do not open at the same time. Such buds are said to be dormant, and they preserve their viability for many years. The buds open when there is injury to higher parts of the trunk and branches. Suckers develop, often in the form of stool shoots. In shrubs the dormant buds regularly yield new trunks to replace the old ones. The ability of dormant buds to yield shoots is important in forming the crowns of ornamental and fruit trees and in growing hedges. Adventitious buds form aboveground shoots known as root suckers on the roots. The role of buds in vegetative propagation of plants is very great. In some plants, special brood buds, or bulbils, develop in the axils, in inflorescences, and even on leaves (Bryophyllum). They fall from the maternal plant, sprout, root, and yield a new individual. In fruit raising, vegetative propagation by grafting involves a small piece of the stem with a dormant bud known as the eye. Buds on potato tubers are also called eyes. Serebriakov, I. G. Morfologiia vegetativnykh organov vysshikh raslenii. Moscow, 1952. An embryonic shoot containing the growing stem tip surrounded by young leaves or flowers or both and frequently enclosed by bud scales. 1. To graft a plant by inserting a bud of one plant into the stock of another.